The Predictable Failure of Educational Reform: Can We Change Course Before It's Too Late? Sarason challenges educators to understand that to continue tostruggle for 'power over' rather than 'power with' overlooks themutual interest of all parties that will stifle any real progressin education reform. In a classroom utilizing effective teachingpractices students would respond to the question, 'How do you ratethis book?' with all thumbs up. SEYMOUR B. SARASON is professor emeritus of psychology in the Department of Psychology at the Institution for Social and Policy Studies at Yale University. He is the author of numerous books, including The Case for Change: Rethinking the Preparation of Educators (Jossey-Bass, 1993) and You Are Thinking of Teaching? Opportunities, Problems, Realities (Jossey-Bass, 1993). 2. Conceptualizing the Education System. 3. Internal and External Perspectives on the System. 5. Case in Point: Power Relationships in the Classroom. 7. Reform Efforts: Implementation, Imitation, andReplication. 8. For Whom Do Schools Exist? 9. An Overarching Goal for Students. 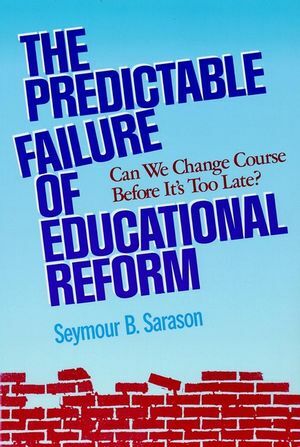 "Sarason challenges educators to understand that to continue to struggle for 'power over' rather than `power with' overlooks the mutual interest of all parties that will stifle any real progress in education reform. In a classroom utilizing effective teaching practices students would respond to the question, `How do you rate this book?' with all thumbs up."